I was kindly invited to teach two mini-seminars for Kajuen ryu Ju Jutsu. My mandate was to teach a shortened version of my children’s self-protection programme and to teach martial arts cross-training in a short seminar to the adults. This diary entry details the former. Respect & Attitude. In essence, believing you are worth defending, respecting the material being taught and avoiding potentially violent situations. We looked at why fighting should be avoided – including age-appropriate videos showing the difference between fantasy and real violence. We talked about personal space. Predator vs Prey. Beginning with the classical bulldogs or build-up tig/tag game, we did a series of competitive evasion, awareness and tactical escape games. This ended with predator vs prey, where children spotted and tried to avoid the “predators” in the game. The game was then discussed and applied to the realities of recruiting help in a dangerous situation. The game can also be used to develop effective fighting tactics against abductors. The Fence. Based on the principles of protecting, preserving and respecting personal space, we looked at the Fence. This is simply a boundary line set by an individual to decide whether or not they are physical threat. It then acts as an action trigger for a pre-emptive strike. We focused on the actual fence principle to begin with, testing it with verbal deception and aggression. We also discussed options and when they might be justified – compliance, dissuasion, assertion and fighting. Once the boundary line concept was confirmed, we moved onto striking targets. We covered dealing with predators around the same size and larger predators. Tactics were adjusted and trained accordingly. We then discussed courage. Here we talked about the myth of fearlessness. Reporting incidents. Here discussed why it is important to report any violent or potentially violent situation. Discipline was then covered, the importance of maintaining skills and training hard. Open mind was also touched upon. This addresses adapting to situations and tailoring one’s training. The children at Kajuen Ryu were the delight to teach. They asked great questions during and after the seminar and showed a lot of enthusiasm for the training involved. 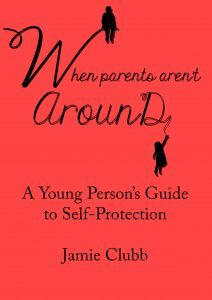 This seminar is based on my book “When Parents Aren’t Around: A Young Person’s Guide to Self-Protection”. Buy your copy here. If you are interested in hosting me to teach this unique programme please get in touch via the website email address.